BEARDED BELLA: Find it here. 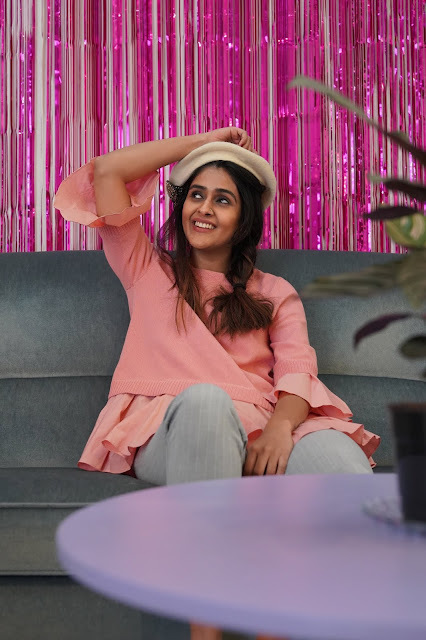 Somewhere between my love for pastels and a need for good coffee is the perfect cafe that is pretty, pink and whips up the finest freaking french toast. (10 points to Gryffindor for that alliteration). At an address that sounds as chic as the cafe, this place finds itself at the top of the list of cafes I discovered last month in Singapore and would 10/10 go back to for cute interiors (and exteriors), brilliant brunch food and a mean piccolo (in the CUTEST take away paper cup). MERCI MARCEL: Find it here. 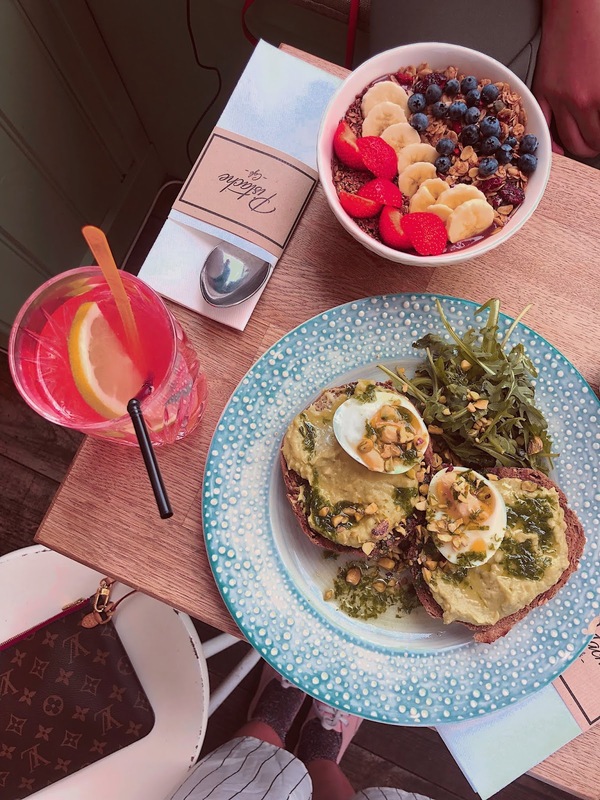 If you are already judging me (and my brunch partner extraordinaire, my sister) for our french toast and avocado toast circa 2019 millennial-ish food choices, then wait till you get to the end of the list. It simply cannot be helped. The taste buds want what the taste buds want. 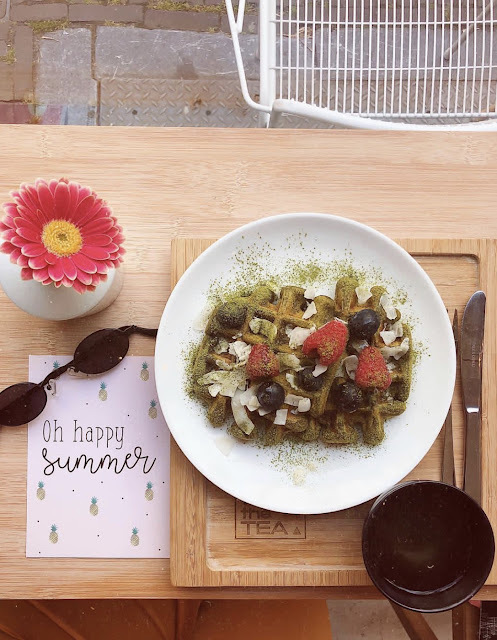 This beautiful french cafe located in the hipster locale of Tiong Bahru faired surprisingly well on my list thanks to its al fresco dining option with the perfect amount of greenery and wooden patio furniture. The french toast had a nice crunch to it thanks to the addition of the almond flakes and the avocado toast and poached eggs were pretty yum (especially the bread) too. COFFEE ACADEMICS: Find it here. Sometimes it's the flukes that land you in the cutest places (complete with neon signage et al). Scott's Square, one of the hippest shopping spots in Singapore is also home to this chill yet very cute in its details cafe. I also discovered that it's a chain that originated in HongKong. If the name wasn't a dead giveaway, they take their coffee seriously and my sister and I found ourselves (very conveniently, if I might add) seated right under the neon signage with the floral centre piece et al. 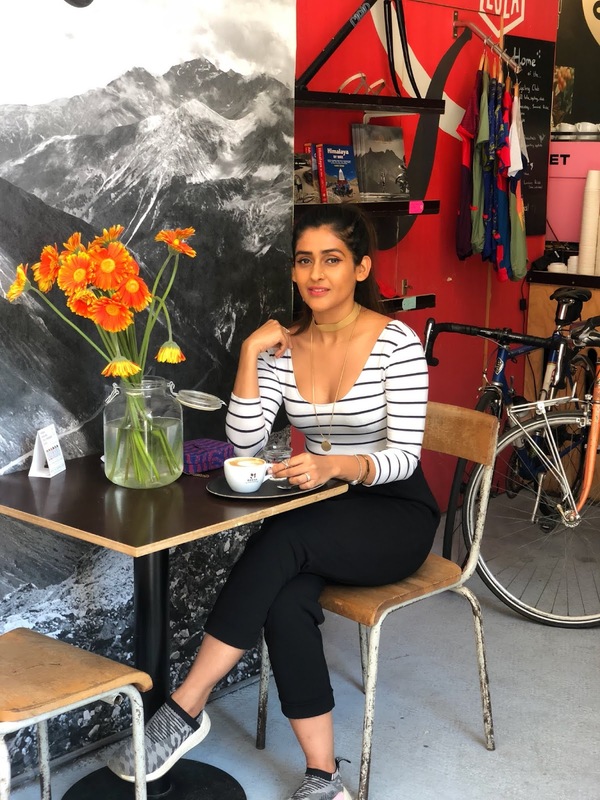 I had this latte with agave pepper and it was particularly yum and our millennial (only in sensibility, not in age) selves also found ourselves ordering the passion fruit 'cruffin' (Croissant+Muffin, YEP it's a thing.) which was a pretty darn good combination of both its mama and papa. SYMMETRY: Find it here. Symmetry comes with an automatic debit of cool brownie points thanks to its Australian sensibility. Again, the al fresco dining option automatically won my heart (hello, beautiful Singaporean architecture that involves colourful windows). We went quite crazy and ordered ourselves (beat it!) an avocado toast with truffled mushrooms (YAAAAAAS) (also, note the sarcasm) and a stack of pancakes (that I wouldn't reminisce much about, to be honest). The addition of the banana ice cream was cool but the pancake itself was forgettable. Our fresh juices came in cute Tiki style glasses (don't quite know how that fits in the vibe but we loved it none the less). PS. CAFE: Find it here. Some good things in life need refresher courses. If you read my first article about things to do in Singapore, you would have found my deep founded love for the PS. Cafe chains somewhere (all over) in there. So it seemed sort of unfair to let this one sit out this piece since the food quality and the general vibe of the cafe seems to be steadily consistent over the years. We went to the one on Harding Road and the larger than life floral centre pieces (and literally nothing else for decor) seemed to still hold its charm over me. It also helps that the menu is extremely elaborate and you can almost go wrong with nothing. Share the love with that one friend who is clueless about where to eat and is heading to Singapore. Or even if he/she knows, I promise I know better. My questionable brand of humour aside, I hope you enjoyed the piece. Don't forget to comment below if you have other suggestions and with your thoughts of course. So this is what cheating on your first love and then realising you couldn't live without it and hence coming back to make amends, must feel like. I had to check twice to ensure my blog was still standing. Thank god for automatic payments.I have now officially been in The Hague for nearly 3 months short of a year and it has been exhilarating to say the least. Endless amounts of travel, adventures with my partner and fashion and food discoveries unending. 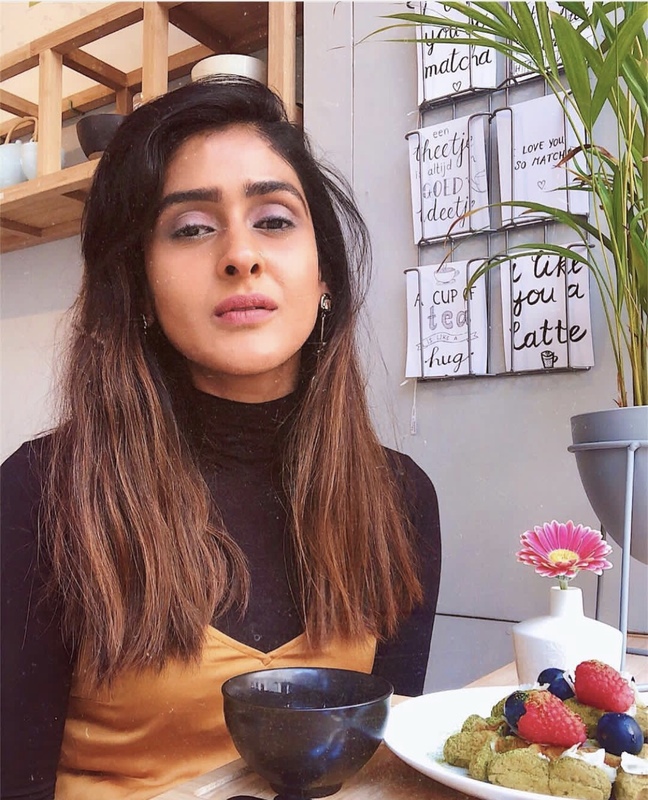 Without further ado, here is the list of my top 5 most instagrammable (yes, that is a word now) cafes in The Hague or Den haag if you may. Over the course of seven months, I made it my personal mission statement to find the most instagrammable cafes in the city and try out all of them. Safe to say, I've hunted out most of them and listed what I like best about each and rated them on the 'gram factor and food for you. So bookmark it, send it to your friends/family travelling or just pin it on to your '2019' travel goals and make that trip to the lovely city of The Hague. MUGS AND MERMAIDS: Find it here. Mugs and Mermaids is literally straight out of your 'The Little Mermaid' fantasy. It's a cosy little cafe which has a cute outdoorsy set up too with furniture painted aqua blue. The food is quite the instagrammer's delight and here's the best part: it tastes fantastic too. 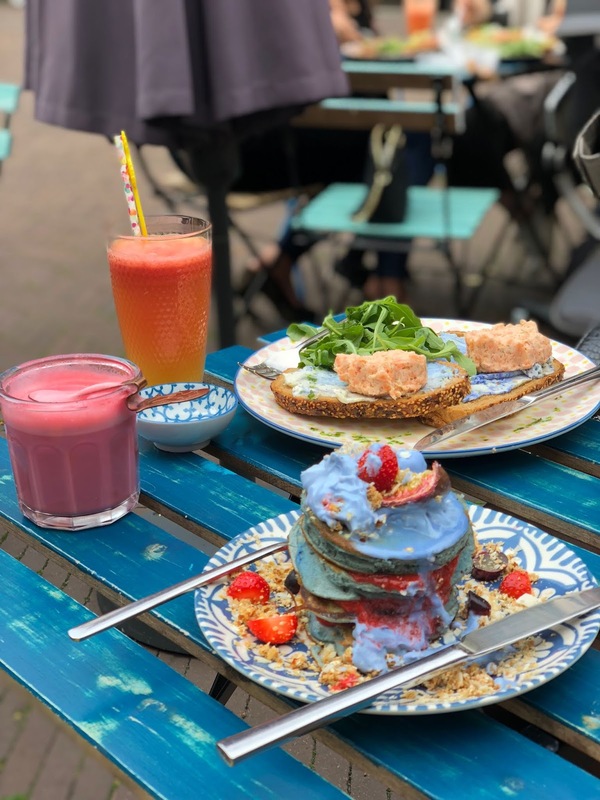 Shades of blue, pink, red with a lot of rainbow-y natural elements in your dish (so no crappy quality colouring business) make it a must-eat-at/must-take-photos-at in The Hague. My suggestion? The mermazing pancakes and the beetroot latte. CONFETTI: Find it here. Confetti is a pastel-everything-lover's dream come true. With interiors done up in the cutest tones of pale pink, lilac and a sea foam green, they ensure that everything they serve comes with a luxurious topping of funfetti sprinkles and actual stirrers with bits of confetti on them. They have a disco inspired/ confetti wall that I particularly love and makes for the best backdrop for photos. My favourite element has to be the pile of sweaters kept in the cafe cause it's The Hague and there's always a chance you're cold! My suggestion? The smashed avo sandwich and their everyday special cakes. PISTACHE CAFE: Find it here. Pistache Cafe is one of the most tastefully done up insta-friendly cafes in The Hague. Everything is pistachio green (yep, if you notice I have a thing for pastels!) and the sheer amount of actual greens (plants, silly!) are a treat to sore eyes. The mirrored accents and the leafy art complete the look and you can't complain about the food either (it's a clean and organic eating format). It helps that it's right opposite the palace. My suggestion? The sandwiches and the toasties. HUG THE TEA: Find it here. If a matcha bar didn't make it to this list, what an absolute pity it would be. But given that I am a huge matcha enthusiast, I had to track down the first Matcha bar in The Netherlands which also sells its own blend. They have a very interesting tea menu, needless to say and the matcha flavoured food (both sweet and savoury) gives it automatic instagram points. It's cute and cozy and green and perfect to sit in a corner (and take sly photos of your food).My suggestion? The matcha waffles with fresh fruit and their teas of course. LOLA BIKES AND COFFEE: Find it here. I walked in here first because it had the cutest name and was in the vicinity of all the cool art spaces around Noordeinde. Lola Bikes and coffee as the name suggests is a biker themed cafe which couldn't be a more appropriate theme in the Netherlands. The walls have bikes mounted on them which make for the perfect photo op. Also cool instagrammable content includes details about their biking clubs, workshops and the bikes mounted for sale and rental. It doesn't hurt that they whip up a really good flat white. My suggestion? Your style of coffee. They always get it right. The search for the 10/10 continues but meanwhile, bookmark your next insta friendly holiday maybe?